Admiral was built by Thomas Morland in 1865 for Charles Dillon as a waterman’s boat to ferry sightseers and picnickers around Hobart’s harbour and for general ferry work. Over the years Dillon, a former convict who had been transported to Van Diemens Land in 1839, built up a fleet of waterman’s boats. Admiral off North Bruny Island. Admiral was much in demand on important occasions, ferrying governors of Van Diemen’s Land and others. At Tasmania’s first Royal Visit, the Duke of Edinburgh in January 1868, Admiral was part of the torchlight procession greeting the duke and the flotilla at the Hobart Regatta two days later. She conveyed a group of dignitaries out to visit the US warship Swatara in October 1875. Dillon died in 1907. Details of Admiral’s career post-Dillon are fragmentary. The oral history states that Admiral became the fishing boat Myra in the early 1900s. Around the late 1960s Myra was sold and renamed Nuilla, a Tasmanian aboriginal name for crayfish. By the late 1970s Nuilla was a very old and tired boat and came perilously close to being lost for good when new owners decided to convert her into a clipper-bowed yacht. Abandoned when the project was found to be beyond their skill, the vessel was stripped and the engine taken out. However, she was sold to new owners who rebuilt her as a gaff-rigged cutter yacht, renamed Myra, and was sold in good working order to a NSW owner around 1986. Once again Myra fell upon hard times, after sinking in Sydney Harbour after work invaded her centre-case. After several years of inactivity laid up on the hard in a boatyard on Mitchell Island in New South Wales, in 2006 she was discovered in a sorry state, and on the verge of being burned once more, by friends of retired Tasmanian fisherman of Bern Cuthbertson. 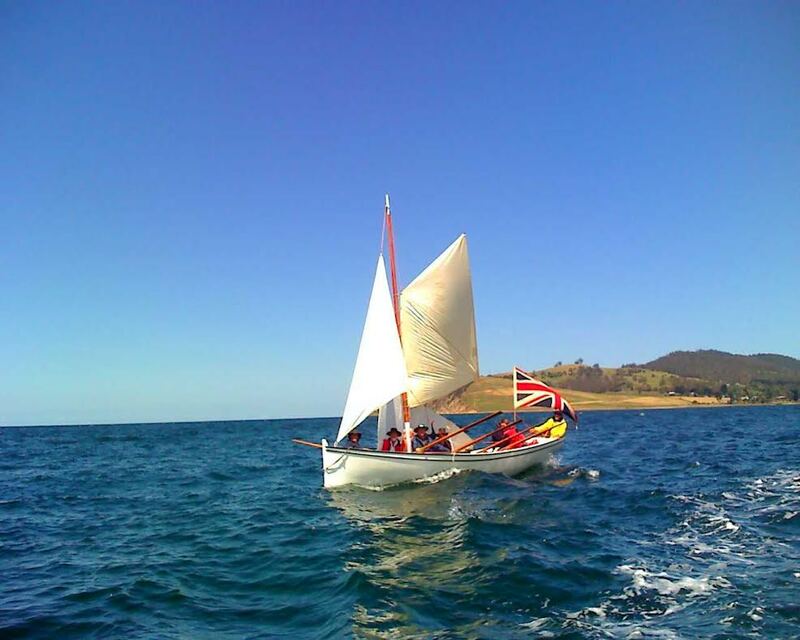 The boat was freighted from Sydney back to Tasmania in 2007 and restoration began in an apple shed in the Huon Valley by a group of dedicated volunteers, the Admiral Restoration Group. Work began on stripping her back to the basic hull structure of the original vessel. Decks and beams were removed and six feet off her stern bringing her back to the original length of 28’ 6”. Materials were recycled as much as possible. Copper nails were removed and straightened and then used in the reconstruction. Fortunately 80% of her original planking was saved, having been removed and restored. The keel, which was blue gum, was rotten and had to be replaced with celery top pine. The rudder, tiller and oars were all made from scratch and gudgeons, pintles and rowlocks were newly cast from templates created using historical information. On 21 November 2009, at Huonville, Admiral re-entered the water for the first time in the best part of a decade. A test row showed she was fit for a voyage to Hobart and she triumphantly returned to Waterman’s Dock on 5 December 2009 after a lapse of over a century, fittingly carrying the Governor of Tasmania. She is now a popular attraction at boat shows and exhibitions, and a tribute to the gallant band of volunteers who restored her. Van Diemen’s Land became Tasmania in 1855. Julian, Great to see the article on the Admiral restoration. I was one of the group of 13 that put up funds and then did all the restoration work. We called ourselves the Admiralty , with Bern Cuthbertson (now deceased) the driving force of the group, as the Admiral. Work took us over two years of patient and slow restoration. Our objective was to maintain as much of the original vessel as possible.- A plaque fastened on the transom of the restored vessel nine names of those who did all the restoration work. We are currently trying to find a home for the boat. The Maritime Museum says it does not have any room for such a dislpay. You as a shipwright would appreciate the amount of work needed in such restoration. We even crafted the oars. laminating up strips of wood, and having a hollow shaft to try and lighten them. I can forward some photos of the restoration if needed. Regards and fair seas Brian Hodgson, master, Lady Nelson. Hi, Brian – yes please do send me some photos (via email) of the restoration. I’ll do a follow-up blog.